I used to have a pair of “rock” speakers hanging around the yard. I couldn’t tell you how much I paid for them, but it wasn’t much and I got what I paid for. They weathered away within a few years into what looks like rock-shaped multi-color foam-looking pieces that don’t do anything but make the backyard look trashy. So I read around to a few places (like cnet, wired, poc and so on so on). There are a LOT of speakers out there. This time I decided to spend a lot more than I did before and get something. 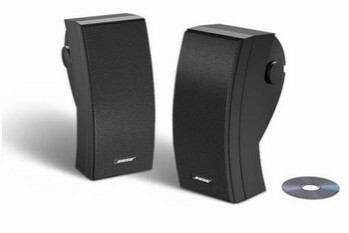 Poc had some things to say about the Bose when I read their review here http://pocinc.net/blog/product-reviews/review-bose-251-outdoor-speakers and thought to myself that these not only sound like they sound good (that sounded…repetitive lol), but they look abstract and I like that. I wound up picking up a pair and love them. I wound up designing a surround for my porch with glass panels in it every 1.5ft to give the yard a more artsy fartsy rich look. In the end these cost me a lot of money because they made me want to start working on things back here haha. Well, i bought these because I got a god deal on them....100 off the sticker....but I would gladly pay the full price. I have them at my cottage hooked up to a RCA RT2500 stereo reciever and everything I play is crystal clear no matter how load you want......Last month I had a guy from across the lake come over and complain about things being to load.....Following a few beers and showing him my outdoor cottage system....4 of the 251's.....he now has his own pair. Great speakers! Great sound! I have a pare of Polk Audio AW M3 Speakers and I recently put them up against the new Bose 251. No comparison, the 251s blew them off my house and into the garage sale. Do yourself a favor and purchase good speakers once. My 901s rock the inside as the 251s rock the wilderness. MUST position speakers correctly. HEAVY(literally)Speakers. Discontinued! I bought these NEW 15 years ago @ some electronics store now defunct. Knew NOTHING about Bose...BUT great looks for tower speakers and Bose had the name and good reputation. At any rate, I am writing because for 14.5 years I never really listened to these speakers. For Christmas, my brother bought me a vintage Dynaco Stereo 70 amplifier and PAS III PRE AMP. Also, a Thorens 125 MKII turntable. All vintage components, all reconditioned to like new status. My brother said I should invest in some quality speakers for my new system, Triangles or some other. He said Bose speakers are junk. Well we hooked all the vintage gear up to the Bose 10.2's...my jaw dropped to the floor(so did my brother's)when we heard the prestine sound...It was like a whole new world opened up! The 10.2 speakers(pre Dyanaco system) sounded like they were under a blanket. Suddenly I'm listening to crystal clear highs/mid ranges and deep, rich bass. All in all beautiful sounding speakers! Say what you will about current quality of Bose Speakers. The 10.2'Series were built to last! 15 years on...they sound(finally) amazing to me. Excellent design,durability,and a 5 year warranty. Bass seems a little distorted at high volumes,but that won't be a problem unless your neighbors are really cool. These things sound great and I've gotten many complements on them.They are a little limited in the bass they put out but overall they sound really good,I guess it's because the size.I put them out on my covered patio which is 25x23 with a 9' ceiling and they really fill it with great sound.It seems the further you move away from them the better they sound because the drivers don't face straight ahead but are turned different directions filling the area with great sound.Anyone that tells you your just buying a name with Bose should really sit down and take a good listening. Good quality highs, and clear at even high volumes..
As these were meant to be used outdoors, I never got around to putting up the brackets and running ridiculous amounts of speaker wire through my house and vinyl siding..So I decided to put them in my living room and connect them to my newly acquired Technics Sa-Sa20N Receiver...The sound for what it is- an outdoor speaker-is great...As far as bass, its minimal which should be improved upon if these are meant to spread over an outdoor setting...The highs are good, but overpower with the lack of bass...Then again it could be my "DVD Audio" ready receiver. I bought these (in white) when they first came out about a year and a half ago. We had a pretty extreme winter up here last year and I left them out all year - they played perfectly afterwards. I think they sound and look great. My only complaint is that the brackets don't swivel horizontally (you CAN adjust them up and down but not side to side). By the way, while I think these are great speakers for outdoors (and probably indoors), I don't believe in the star inflation that seems prevalent on this site. I purchased these about 6 months ago. So far so good. They seem to handle the Florida humidity pretty well. I use them outside in my covered lanai out by the pool. They do not produce the bass like I would like. However my house is made of cement block and stucco. I get a hollow sound to some extent. They sound fine for their intended purpose. I wasnt expecting the best sound but rather durability over the long haul. as I said earlier.. so far so good. Besides with the kids playing music on them while they swim .. how good can Britney and N'sync sound anyway?